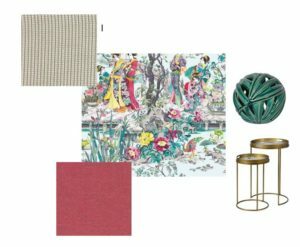 These looks both embody an oriental vibe, however in completely different ways. 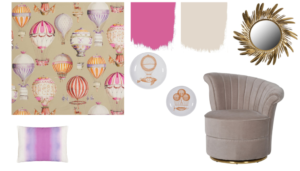 Here we have put together some schemes inspired by our current window displays. One showcases a busy, bright and beautiful wallpaper that will be the star attraction. Matched with fabric in an upbeat pink, and a textured semi sheer to keep the space light, this scheme is perfect to bring spring into any space. Bring in accessories using the vibrant range of colours in the wallpaper. Secondly, this geometric design is a modern twist on traditional oriental patterns. The bold blue lends itself to blend beautifully with grey interior. 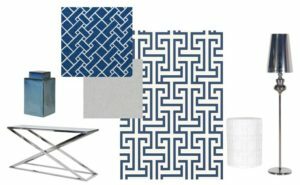 The navy and white wallpaper is fresh and fashion-forward, so paired with sleek, smart accessories this makes a sophisticated, stylish scheme. 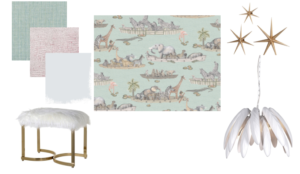 This safari themed scheme is perfect for any kid’s area. The gold accessories are a nice touch to bring in some warmth and richness. Using soft pastel shades alongside crisp white creates a flawless balance. This look is fun without being too silly, it would fit in admirably with any contemporary interior. This second scheme for a children’s space, has a more vibrant vibe. 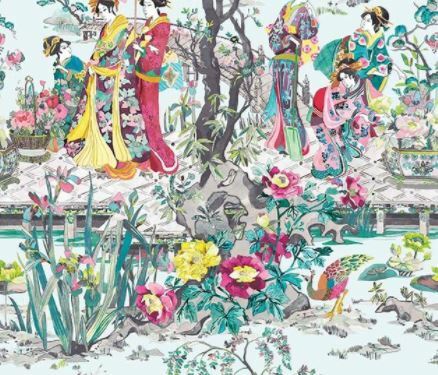 Stunning pops of colour bring this unusual wallpaper to life. Funky accessories make this scheme accessible for children of all ages. This scheme moves towards a warmer look, avoiding the typical grey colourways. For further information on what we have used in these schemes, feel free to contact us, or pop in store to speak to our friendly staff.